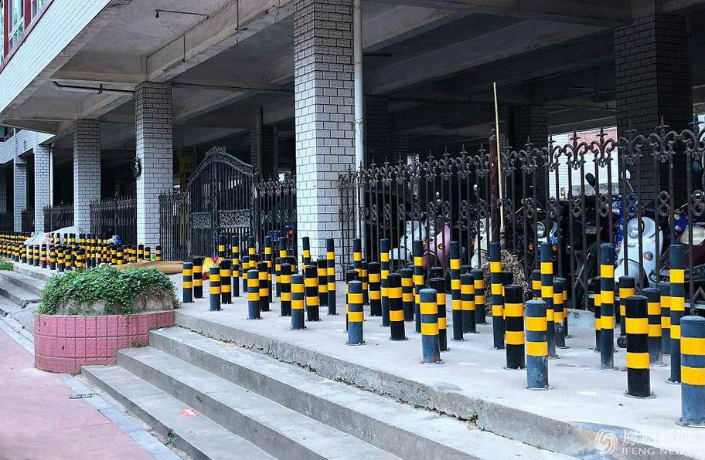 In a bid to keep homeless people from gathering to rest on a walkway in Liuzhou, authorities in the Guangxi town have installed a forest of vertical steel poles so dense that the sidewalk appears to have been rendered unwalkable. Reports from local media indicate that the stretch of pavement had become a preferred resting ground for unhoused people in the area, partly due to a convenient overhang shielding the area from rain. According to Guangxi News, a small community of approximately 10 rough-sleepers had begun to make the covered walkway their home in 2016, sleeping on cardboard pallets and using the area to store collected recyclables for future sale. The method that the Liuzhou authorities employed is known as ‘hostile architecture’ – a technique long ubiquitous in the UK and parts of North America and now slowly gaining ground in China – wherein everyday objects are deliberately made less comfortable, useful or accessible in order to bring about a desired social effect. Take this underpass in Guangzhou for instance, where intimidating concrete spikes have been installed to discourage so-called vagrants, or anyone else for that matter, from stopping for a rest. Also in Guangzhou, ‘concrete sprinklers’ were installed in front of a urban management office building in 2015 and programmed to go off every two hours for 20 minutes at a time, according to Nanguo Metropolis Daily. Their purpose was not to water plants, but rather the bodies and property of those who sought shelter on the neighboring pavement. Guangzhou’s Riverside Hotel employed similar tactics in an effort to repel street dwellers from a covered walkway that same year. Meanwhile, in Shandong’s Yantai in 2010, officials took things a step further by installing ‘pay benches,’ which would only retract steel spikes to allow park-goers to take a seat when coins were inserted. Critics of hostile architecture say that it degrades social life in urban environments by reducing their livability and chipping away at public territory where people feel welcome. Even architecture designed to target specific groups tends to make the urban landscape less pleasant and comfortable for everybody. The recent events in Liuzhou are a case in point: While the authorities certainly succeeded in making the walkway difficult to navigate for pedestrians (presumably not their desired effect), they have seemed to fail in preventing the former residents from continuing to lay down their weary heads. For some unsettling photos of more hostile architecture from around the world, see this gallery.